Guns? Who needs guns when you've got the buisness end of a Mig jet engine mounted on your tank's turret? That'll show those land mines who's boss. Our friends at Oobject have assembled 12 of the oddest armored vehicles to ever grace the battlefield. Looking for more absurd armor? Check out these 12 pink tanks, some armored trains, and these armored face masks. Designed in 1940, it comprised a glider and lightweight T-60 tank with its unlocked tracks as landing gear. Clearly the design inspiration here is from a steam tractor. Only one prototype was made of this ludicrously over-designed vehicle. Looking at the inscription on the front, the Besta seems to have been a sort of armored track layer. This is an interesting example of an evolutionary design dead end. In the development of big guns on wheels this looks more like a cannon than a vehicle. 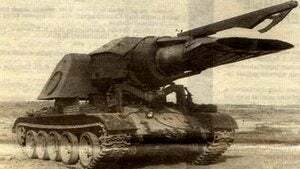 A Russian tank with a Mig jet engine mounted on it, to clear mines by blasting them with heat.